Rusty Schlenk won the UMP Late Model Feature for the second time this year at Oakshade Raceway. Schlenk started inside the second row of the Don Williams Excavating Night UMP Late Model Feature and immediately went to work on pole sitter Mike Miller. The two battled hard and spun in front of the entire pack, stacking things up behind them and bringing out the only caution flag of the race. The result was a complete restart which was a lucky break for Miller and Schlenk as they both got their starting positions back. Schlenk wasted no time getting the lead. By the time they got to the backstretch, Schlenk was in command. Brian Ruhlman moved up to second and began to make up just a little bit of ground on Schlenk’s large lead in the latter stages of the race as they worked through lapped traffic. Schlenk went uncontested to the checkered flag with Ruhlman finishing in second. Dusty Moore assumed the Oakshade UMP Late Model points lead with his third place finish. Zach Olger was fourth and Rody Schroyer finished fifth and falls three points behind Moore in the point standings. Veteran driver George Lindsey sat on the UMP Sportsman Feature pole and proceeded to open up a lead over the rest of the field until a debris caution on lap eight tightened everyone back up behind him. Brian Fisher took advantage of the opportunity and got to the inside of Lindsey and after a few laps of side by side racing, Fisher took the lead. Shortly after Fisher took command of the race, Rob Anderzack brought out the red flag after a scary incident in which he slammed the front stretch wall extremely hard coming off turn four. The car got slightly airborne and burst into flames as it came to rest. Anderzack quickly climbed out of the car under his own power. The excitement continued back under the green flag. With Fisher leading the way, Ky Harper was picking off positions using the high groove through the corners and eventually worked his way up to the lead on lap 17, just as another caution came out. That turned the lead back over to Fisher and set up a great race to the finish. The two drivers battled side by side all the way to turn four on the final lap. Harper slipped up a bit in that corner which was just enough to allow Fisher to pick up the victory. Harper finished a close second with Lindsey falling back to finish third. 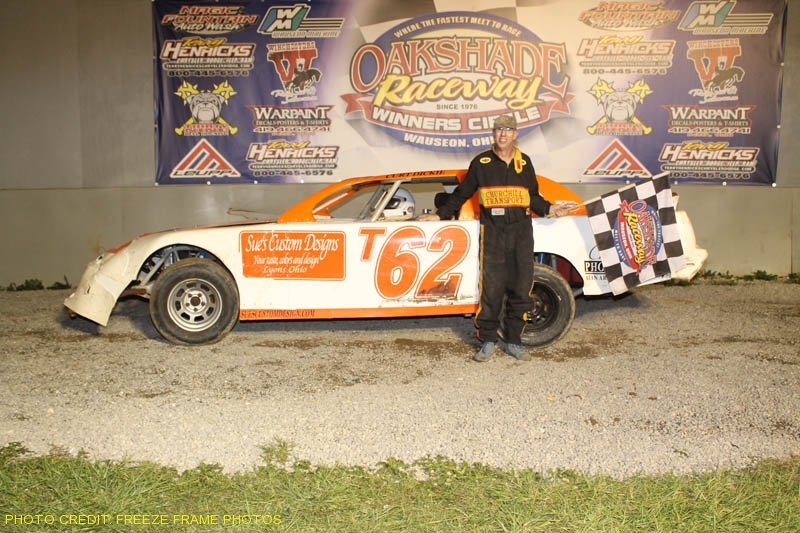 Mike Jessen came home fourth and maintains a 21 point advantage over Brian Fisher for top spot in the Oakshade’s UMP Sportsman point standings. Rusty Smith finished fifth. Todd Silvey jumped out to the early lead in the UMP Bomber A Main. Craig Dippman closed in and took the lead on lap nine. Two laps later, Brad Miller took the lead and went on to hold off the Oakshade UMP Bomber point leader Jim Scout for the win. Brett Miller got by Dippman to finish third as Dippman fell back to end up fourth with Curt Lancaster fifth. Dave Sibberson took the lead from Aaron Boyd on the second lap of the UMP Bomber B Main and went on to post the win. Boyd held on to finish second followed by Jeff Grochowski, Kevin Hanford and Terry Rushlow. Joe Heffner got by Jake Recker to take the lead on the second lap of the UMP Bomber C Main. Jerry Signor quickly closed in and had a heated battle with Heffner before finally taking command of the race for good on lap five. Signor went on to capture his second C Main win of the year with Heffner settling for second. Chuck Faller finished third with Jake Reckner and Matt Rose rounding out the rest of the top five. It was another exciting night for the four-cylinder UMP Hornet division with Dylan Burt picking up his second win of the year. Celebrate the Fourth of July weekend with the Howard Miller Memorial at Oakshade Raceway on Saturday, July 5th. In addition to the great UMP Late Model, UMP Sportsman, UMP Bomber and UMP Hornet racing, there will be a fireworks display courtesy of Crazy Joe’s. Gates open at 4pm with racing at 7pm. Casey Noonan won the 40-lap 19th Annual Barney Oldfield UMP Late Model Feature at Oakshade Raceway on Saturday night. Kevin Reeve started on the outside of the front row after winning his heat event earlier in the night and snatched the early lead from pole sitter Mike Bores. Defending Barney Oldfield Race Champion Ronnie Perrine Jr. from Lima, Ohio, pressured Reeve for the lead during the first quarter of the race. The first yellow flag flew on lap 11 after Ky Harper’s car rolled to a stop in turn two. Mike Bores, Mike Miller and last week’s feature winner Bill Hahn piled up on the ensuing restart to bring out another caution. Casey Noonan started ninth and worked his way up to take the lead from Reeve at the midway point of the race and then pulled away from the rest of the field. Rusty Schlenk worked his way up to second and began to reel in the race leader, but didn’t have enough laps to close the distance on Noonan. Noonan went on to a convincing win picking up the check for $4400 for winning the 19th Annual Barney Oldfield Race. Bill Hahn started on the pole and captured his first UMP Late Model Feature win of the year at Oakshade Raceway on Saturday night. Brad Eitniear and Bill Hahn battled for the lead early in the feature event that ran caution free. Hahn eventually won the battle and began to extend his lead. Zack Olger moved into second by lap three and closed in on Hahn. Olger caught him by lap 11 and got alongside for the lead. Olger’s progress was thwarted by a lapped car that he had to check up for. Olger was unable to recover to mount another challenge and fell back to third after Rody Schroyer, Oakshade’s UMP Late Model points leader, passed him on lap 16. Schroyer was unable to get close to Hahn as Hahn held on to take the victory after lapping a good portion of the field. Olger finished third followed by last week’s feature winner Dusty Moore and Ronnie Perrine Jr.
Tim Fisher took the lead from Tim Line on lap two of the UMP Sportsman Feature and went on to pick up his fourth win of the season to add to his points lead. Multiple cautions kept the field tight with Mike Jessen working his way up through the field to second. Jessen tried to work the high groove to mount some kind of challenge on Fisher for the lead, but just was unable to catch him. Jessen settled for second with young driver Matt Lindsey finishing third. Joe Derbeck was fourth with Brian Fisher fifth. The UMP Modifieds made their only appearance of the year with an exciting feature event. Darryl Banks grabbed the lead at the start from the pole and led most of the race. This race would also be plagued by a slew of cautions that kept shuffling the running order behind Banks. Terry Hull marched his way toward the front and got by Banks late in the race, but Banks made a final bid for the lead on the final lap. He dove to the inside of Hull as they entered turn three and muscled his way by to take the checkered flag. Josh Scott finished third behind Hull followed by John Brooks and last year’s UMP Bomber Champion Tom Ordway. The UMP Bomber A Main was dominated by Chris Henry, leading the entire distance. Jim Scout managed to get to second but couldn’t challenge Henry who won his third UMP Bomber A Main of the year. Craig Dippman finished third followed by Dan Shaffer and Jeff Foks Jr.
Another dominating performance was displayed in the UMP Bomber B Main, this time by Curt Lancaster. Lancaster started on the outside of the front row and took command early en route to pick up the victory. Kevin Hanford followed for second with Jake Gamber third and Zach Tipton fourth. Ron Leonard finished fifth. Rick Dippman and Chuck Faller traded the lead early and often in the UMP Bomber C Main. Dippman got control of the race early until he slid up high in turn three on lap five allowing Faller to get by. Dippman regained his composure and the lead on lap seven and never looked back. Dippman held off Faller to pick up the victory. Cody Houston, Walt Helsel and Ron Bloomfield rounded out the rest of the top five finishers. Tyler Line continued his undefeated streak in the UMP Hornet division once again taking the checkered flag after Gab Mueller cut a tire while battling with Line. On Saturday, June 14, Oakshade Raceway will host the 19th Annual Barney Oldfield Race for the UMP Late Models paying $4400 to the winner. UMP Sportsmen and UMP Bombers will also be in action with gates opening at 4pm and racing at 7pm.